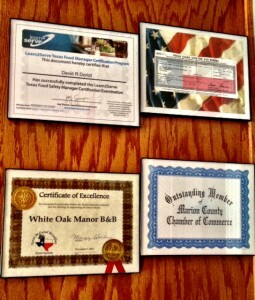 Jefferson Texas' only Inspected and Approved Inn! 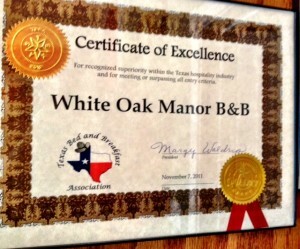 Did you know that Texas has a bed and breakfast association? In fact many states do now have associations. Each state has a few rules that may be different but over all they have more similarities. All properties bearing the Texas Bed and Breakfast Association (TBBA) “seal of approval” have passed a rigorous inspection process. They are not only comfortable and charming, but professionally-run, safe, clean, and unique. Membership in Texas Bed and Breakfast Association (TBBA) is the public’s assurance that the lodging is inspected and approved. Association members provide true Texas hospitality and meet all guidelines for excellence and safety. From historic hotels to romantic Victorian mansions, and from distinctive farmhouses to waterfront B&Bs, all properties displaying the prestigious Texas Bed and Breakfast Association (TBBA) logo are among the best in the state. 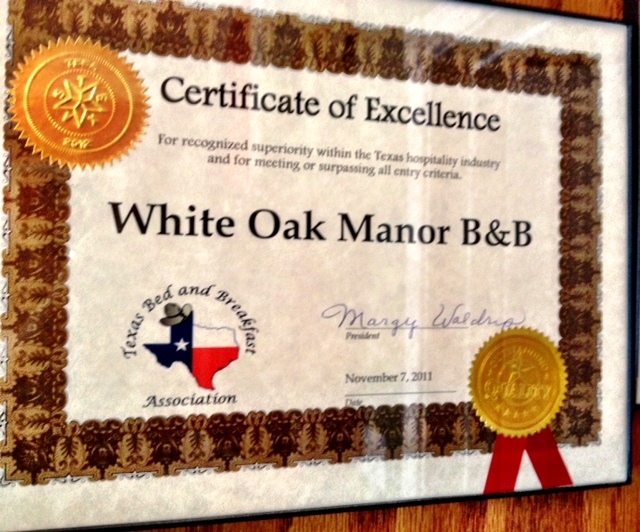 When we bought the White Oak Manor bed and breakfast it was our intention to belong to our state association. We feel that while it doesn’t matter to some people that normal hotels only have minimal inspections, it very much mattered to us. We want our guests to feel very comfortable in the knowledge that we have been inspected and we adhere to these rules for your peace of mind. You see we love going the extra mile to have happy guests. If you have stayed with us you know that we offer those little touches that you will never find in any hotel. Quite frankly we want to be the Best Bed and Breakfast choice in Jefferson Texas for your intimate getaway or adventurous vacation. We first got our legal paperwork in order and then contacted them to inquire about joining. Herb who is the contact for TBBA was very helpful and sent us the necessary paperwork and information we would need. First and foremost an applicant must be inspected by their team of independent inspectors and that takes some time to get on their list. Well as you know already Texas is such a huge state this can take a bit of time. We received the list of requirements and expectations in the mail. Once opened, we went through the list and realized we already had quite a bit of the items on the list done. For instance all rooms have deadbolts on the doors, every room with a fireplace has a fire extinguisher and a CO monitor as well and all rooms have smoke detectors, adequate lighting inside the rooms and outside in our common areas. The inspection approval process begins from the moment we applied. Even our answering phone calls were scrutinized and email etiquette was important too. Then comes the day that the inspectors arrive, this can be a little scary but it doesn’t need to be. They are here to help with ideas if something isn’t working right. After they inspected everything we sat down and discussed some of the items we needed to add and went over our room names, our website, reservation procedures and even landscaping ideas. When they left, we waved good-bye breathed a sigh of relief this step was over and crossed our fingers that we would be a good fit for the association. The next step was our review by the board of directors. We were notified that we were approved which called for a “Yippee” and a celebration. We now belong to the Texas Bed and Breakfast Association which is known for its premier properties and exacting standards of hospitality. A premier property is one that assures the highest levels of service, accommodation and comfort. Premier properties incorporate uniqueness, quality and professionalism. 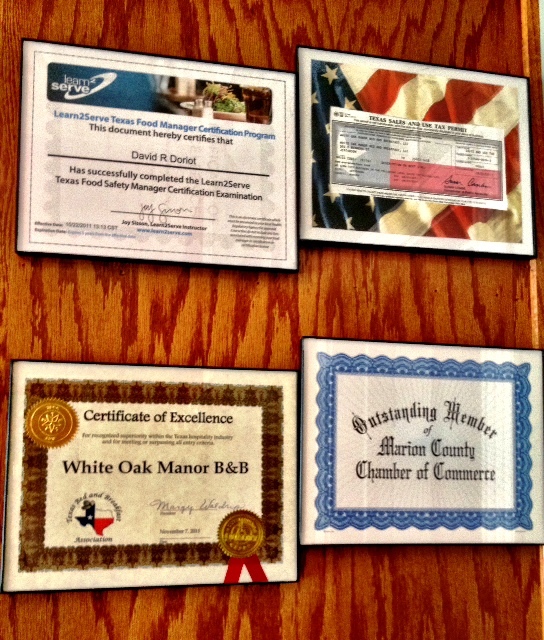 We proudly display all of our certificates and licenses on the wall by the kitchen so that everyone can see them anytime at all.